The fire’s containment also increased, reaching 95 percent, up from 93 percent from Aug. 12. Fire personnel were rapidly downsized during the week as a local, Type 3 team took over from a federal team that fought the fire during its period of dangerous growth. Here’s a look back at daily reports from the two management teams. Thursday: A big burn-offOn Friday morning, fire managers announced that the Plateau Fire had grown 1,766 acres after burning large patch of contained forest within the fire’s northeast section. The fire grew to an estimated 19,554 acres and 95 percent containment. Forty-seven fire personnel connected to the local, Type 3 team led by Jerran Flinders remained on the job. The fire burned a large patch of contained forest within the fire’s northeast section of the fire perimeter, and though it produced a lot of smoke, flames ignited mainly on the ground among needles and other low-lying fuels. Looking ahead, fire managers said that after the burn-off, the fire would lose its bluster, and Thursday would be the last day of significant smoke. The management team also announced that the unburned area in the southwest corner near McPhee Reservoir was no longer expected to burn. 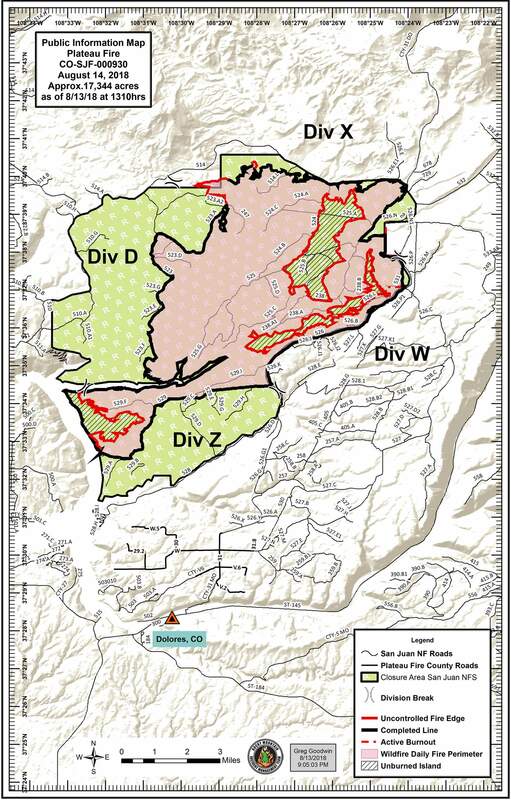 Before turning over command to the current Type 3 incident command last week, the Type 2 Rocky Mountain Incident Management Team Black had predicted that most or all the green areas within the containment lines would burn. The local, Type 3 team assumed command at 8 p.m. Tuesday. Firefighters spent the day felling hazard trees and extinguishing hot spots within 135 feet from the fire’s perimeter. Fire personnel who completed a fire line assessment noted that leaves on small shrubs and aspen were starting to fall, which could restart fires in some areas as the light fuels ignited on smoldering debris. 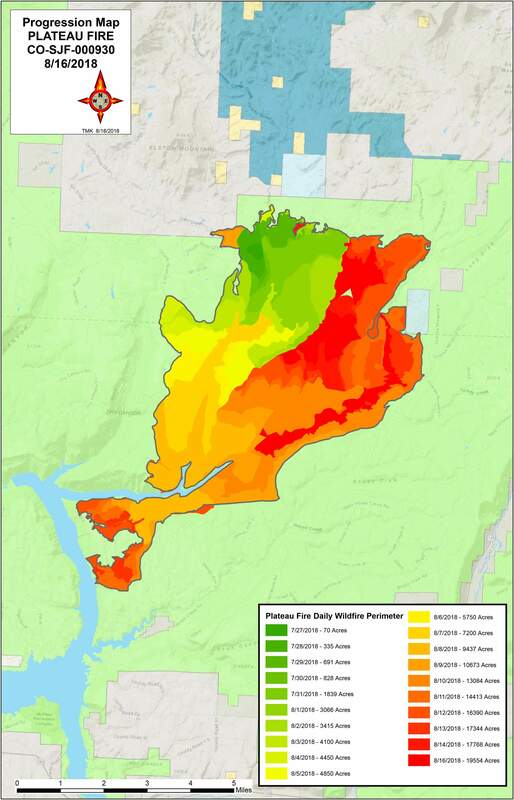 Tuesday: Working at the gapOn Wednesday, the local, Type 3 team that assumed command of the Plateau Fire announced that a flight at 12:30 p.m. showed the fire grew 425 acres during the morning, primarily on its northeast side and along the walls of Beaver Canyon. Based on the previous estimate, the fire grew to 17,669 acres. The Type 2 Rocky Mountain Incident Management Team Black, which fought and managed the fire during its strongest growth, turned over command of the fire to Type 3 incident commander Jerran Flinders at 8 p.m. Tuesday. Flinders’ team began dismantling the incident command center at County Road W and Dolores-Norwood Road on Wednesday morning and planned to set up a small camp near the northwestern edge of the fire. The closure encompassed an area roughly bound by McPhee Reservoir on the west, Forest Service Road 527 on the east, FSR 514 on the north and the San Juan National Forest boundary on the south. Evacuations were not mandatory. The Dolores-Norwood Road (FSR 526), the Boggy Draw trail system and Overlook Trail also have reopened. Nowlin and Plateau Fire public information officer Pam Wilson encouraged drivers to remain cautious on the Dolores-Norwood Road, which travels north from Dolores through the San Juan National Forest. Firefighters and smoke will still be in the area. Plateau Fire information officer Pam Wilson emphasized that the fire management team was confident that the fire line along Dolores-Norwood Road has cooled and is secure. Firefighters have walked the lines to check for hot spots about 65 feet into the line, even feeling the ground for heat. Other forest roads and trails in the fire area remain closed. FSR 514, on the fire’s northern perimeter was reopened, as was the Dry Creek Road (FSR 510), which connects to McPhee Reservoir.